New Delhi: India is clear that technology transfer should be a key part of any climate treaty. Along with more than 130 developing countries in the world, India’s checklist of demands from the rich, held responsible by the poor for the state of the environment, includes the technology element. Technology transfer encompasses everything from collaboration to research, the removal of trade barriers, capacity building and financing. Experts and academics hold that, unlike the actual transfer of technology from the rich to the poor, what India needs most is collaboration with developed countries in technology development and capacity building. “What we actually need is not as much technology transfer as it is technology development. Industries need to be well developed to absorb the technologies. In the early stages, we need joint development to gain access to skills and the intangibles," said Anand Patwardhan, professor at the Indian Institute of Technology, Bombay (IIT-B), and former executive director, Technology Information, Forecasting and Assessment Council. For instance, acquisitions are one of the main routes to gain access to technology, and while there is still a role for multilateral negotiations, it will ultimately happen bilaterally or between companies, he said. The West’s perspective is different, posing the issue as one revolving around what happens to IPRs, incentives to innovators and competitive advantage if these are going to be relaxed. So is there a meeting ground between the two sides, and can Western fears be allayed? “In many cases you need to collaborate with the innovator. The notion of tacit knowledge exists for many technologies. For instance, I can give you all the instructions on how to drive a car, but can you? It is a genuine concern to make sure you get what you need. We need the technology, not the IPR," said Ambuj Sagar, Vipula and Mahesh Chaturvedi chair, professor of policy studies at IIT, Delhi. The issue of IPR translation into a product is not trivial. The drivetrain of the Toyota Prius hybrid car, for instance, has around 267 patents, said Sagar. “You have to (be) pretty sophisticated to change an IPR into a product." Patwardhan agrees with Sagar. He says that unlike patents in the pharmaceutical sector, where the IPR is equal to the product itself, innovation won’t necessarily be at risk. “Even a cellphone will have many patents. You can’t single it out. Unless you can go through the product development cycle, it doesn’t help you. And if you want to bring down cost, you need to do the process yourself," Patwardhan said. “Unlike in pharma, where the bulk of the cost is in upstream IP, which they exploit, here IPR is only the starting point. 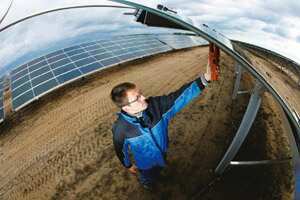 Maximum cost could be capital investment, or scaling up." “Montreal was simple. It was product substitution from one to another, though the applications were different. Here you have the entire energy sector and the points of change are very many, such as demand modification, supply-side change, distribution, etc.," said Patwardhan. IPRs become a bigger issue when it comes to deployment of existing clean technologies in developing countries and not so much in relation to future technologies. If climate change mitigation has to be implemented immediately, then poorer countries need access to existing technologies, most of which belong to developed countries, and collaboration over the divide on big-ticket technologies such as carbon capture and storage, fuel cells, clean coal technologies and solar energy. 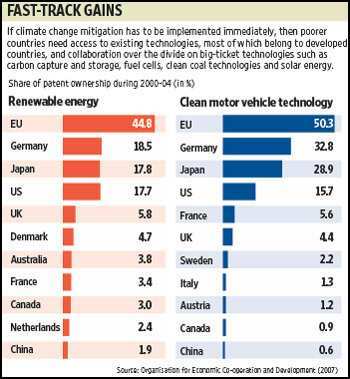 Wess says that distribution of patent ownership of climate technology is skewed towards advanced economies. Negotiations to bring about a so-called clean revolution, which focuses just on the mechanism to transfer and not a resolution on the IPR issues, will be akin to having a pipeline in place, without the goods that will flow through it. IPRs need to be balanced between private profit and public good. “You do need IPRs as incentive. The question is how to address it—buy it out or bring it to the market cheaply?" 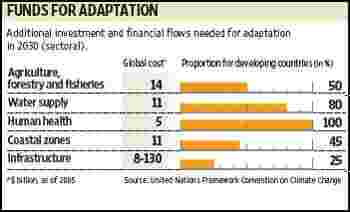 Even in climate change, the world has a precedent in technology transfer in the clean development mechanism, or CDM. This market mechanism, under the Kyoto Protocol, was established to aid developed countries to meet their Kyoto emission cut targets. It involved investments and technology in the private sector to flow from developed to developing economies. Wess attributes this to the involvement of foreign companies in the countries and trade policies. But a key drawback of CDM has been its limitation in terms of scale and being present only in a few countries. Similarly, all countries are not at the same level in terms of domestic capacities and investments. Though India and China have the same demands from the rich global north, the ground situations vis-à-vis technology capacity is different. “In the mid-1990s, when Russia was in chaos, the Chinese had something called a technology bank. They didn’t need it then but" it came in use in the next 15-20 years, said Chandrashekhar Dasgupta, a veteran negotiator for India. “Today, the Chinese understand that they need to get their scientists back from the US. They offer huge incentives for them to come back, such as advanced lab equipment, higher salaries, more staff. They pull out all the stops," he said. “But the same is not possible here. If we do the same, then a researcher who hasn’t gone to the US will get one-fifth of the salary compared to one who comes back. That would be unthinkable." Most experts agree that for deployment of technology, it is advantageous for developing nations if the learning part of the cycle is done locally. “Any new technology is costly. Over time, in a normal market, early adopters do the learning and bring the price down," said Patwardhan. “If you want to accelerate it, you cannot wait for it to happen in developed countries, and then percolate down to developing countries."